Welsh Rally driver Tom Cave is pleased to confirm that he will compete for honours in this year’s Motorsport UK British Rally Championship. 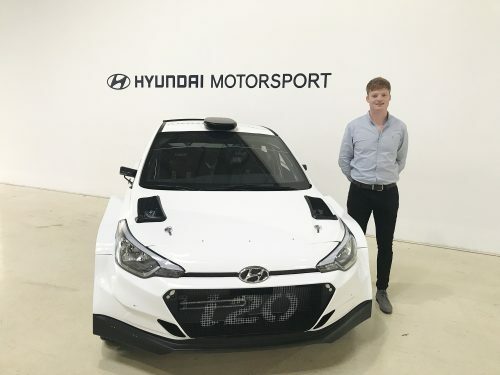 He will contest all of the season’s six rounds behind the wheel of a Hyundai i20 R5, supplied and prepared by the PCRS team that ran a similar car for Tom on the Wales Rally GB in October. “We’ve been working hard behind the scenes to make this year happen, so I’m delighted that everything has come together just in time for the first round and I really have to thank everyone who is supporting me this season. Support for the season comes from Trailhead Fine Foods, who teamed up Tom for last year’s Rally GB to launch their new Get Jerky range of snacks. Also continuing their backing from 2018 is Chester-based HN Nuttall Foodservice, Atech Racing and Walero. Adding their names to the list of supporting partners are Michelin Motorsport and Hyundai Motorsport Customer Racing.